Ohio Chow Chow Rescue View other Chow Chows for adoption. This amazing pup is Daisy! She traveled all the way from Texas in search of her furever home. 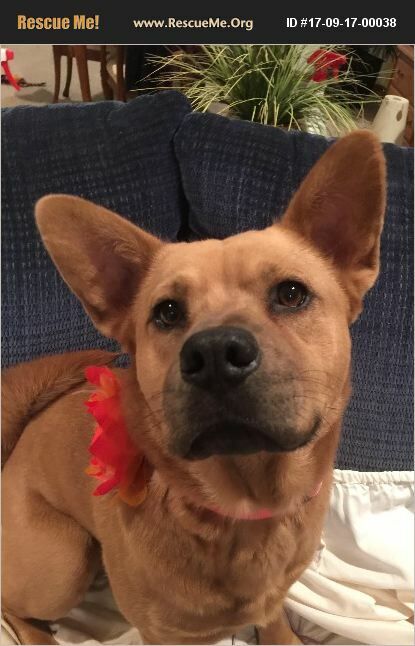 She is a 3 year old, 50 lb chow/shepherd/boxer mix with a gorgeous velvet soft coat and adorable ears!!! Daisy is a cuddle bug and will give you lots of kosses. She loves to curl up with you on the couch. She is a wonderful companion with a fun personality. Daisy loves to play with toys and will entertain you with her playful antics. Say 'get your ball' and this girl is all ready for a game of fetch! Car rides and walks are also on her list of favorites! Daisy is very smart, knows several commands, gives paw, and has good manners. She would do well in a home as a single dog or with another dog, preferably male. Daisy is fully vetted, UTD on all vaccines and preventatives, HW tested, spayed and microchipped. if you are interested in adding this wonderful girl to your family please email is at huntershoperescue@gmail.com We are all volunteers with jobs and families in addition to our rescue dogs. We do our best to respond within 24 hours but please be patient. Applicants under 25 years of age will need to demonstrate an adult lifestyle. If you rent your home we require a letter from the landlord submitted with your application granting permission for a pet. A fenced yard is preferred.